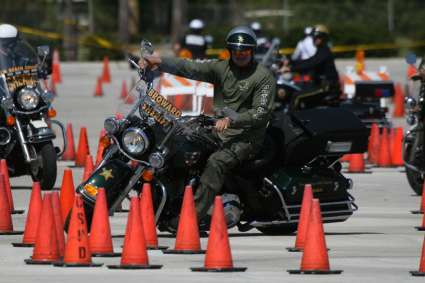 (Pompano Beach, FL) – Broward Sheriff’s Office Pompano Beach Motorcycle Deputy Gary Fischer practices maneuvers in preparation for the 21st Annual South East Police Motorcycle Rodeo. The event runs from 8 a.m. – 4 p.m. this Saturday at the Pompano Citi Centre, located at 1955 North Federal Highway, at the corner of Copans Road. Over 100 police motorcycles from all over the southeast are in Broward for the week-long training and safety trials culminating with Saturday’s rodeo. Admission is free and there will be a drawing for a 2010 Harley-Davidson Sportster 883 motorcycle and trailer. Raffle tickets are $1 and will be available at the event. Proceeds from the South East Police Motorcycle Rodeo benefits Concerns of Police Survivors (C.O.P.S.) and the Muscular dystrophy Association. Last year’s event raised over $50,000 for these worthwhile causes. (Ft. Lauderdale, FL) – That’s Broward Sheriff’s Office Detective Julie Bower (and also TLC’s Policewomen Of Broward County co-star) helping kickoff the annual Muscular Dystrophy Association (MDA) fill-the-boot campaign on Thursday afternoon with Broward Sheriff Fire Rescue Firefighter/Paramedic Ken Desantis (at left). They were joined by Chief of Department Joseph Lello along with crews stationed at Port Everglades and were out on SE 17th Street. Firefighters will be collecting at various locations through Monday all over Broward County to coincide with the 44th Jerry Lewis Labor Day Telethon. This is the 55th year that firefighters have partnered with and supported the MDA in finding cures for the diseases. The International Association of Fire Fighters Local 4321 organizes this event with the local MDA and the firefighters. Last year over $18,000 was raised and they hope to surpass that amount this year. All of the money raised in Broward stays in Broward to help those afflicted with neuromuscular diseases. Police motorcycle officers from all over the country practice the safety skills course at Pompano CitiCentre on Thursday in preparation for Saturday’s 20th Annual South East Police Motorcycle Rodeo competition. Admission for the event is free. Following the rodeo, a new 2009 Harley-Davidson XLH Sportster 883 will be raffled with proceeds to benefit Concerns of Police Survivors (COPS) and the Muscular Dystrophy Association (MDA). Raffle tickets are $1.00 and will be available at the rodeo. EVENT DATE/TIME: Saturday, April 18, 2009 from 8:00 a.m. – 4:00 p.m.
Due to the hard work and investigative efforts led by the Broward Sheriff’s Office and participating law enforcement agencies in the recent homicide and string of armed robberies, Dunkin Brands, Inc. decided to donate funds to crime prevention programs in South Florida to combat ongoing problems. Broward Crime Stoppers received $10,000.00 earmarked for the BSO GREAT (Gang Resistance Education and Training) program coordinated by YIED under Captain Nesteruk. An additional $1,000.00 was donated to Broward Crime Stoppers to sponsor a table at their annual ball. And $5,000.00 was donated to the South Florida Crime Commission to disperse amongst law enforcement agencies in Palm Beach and Broward counties as needed. BSO’s External Affairs Liason Nelson Velez stands atop a Broward Sheriff’s Fire Rescue ladder truck and dumps a bucket of golf balls during the second annual Fallen Heroes Golf Tournament Saturday at the Deerfield Country Club. The ball drop was one of many raffles and contests to raise money for the Sheriff’s Foundation of Broward County’s Fallen Heroes Fund, which helps support the families of fallen law enforcement officers and firefighters killed in the line of duty. More than 140 golfers participated in the tournament. Commander Rick Wierzbicki, who organized the tournament, said he hoped to surpass last year’s amount of $32,000.